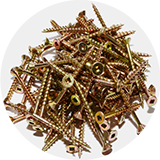 From threaded rods to anti splitplates, we have everything you will need for your project. 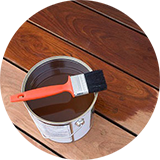 We understand the importance of timber treatment and stock a variety of products. We manufacture our fibreglass ridging ourselves and therefore you can be assured of quality. 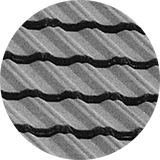 Come and visit us for expert advice on everything from dura-tiles to IBR sheeting! The bundles of grass and cape reed we sell are a reasonable size at a reasonable price. 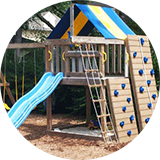 We stock and supply an exciting range on all jungle gym accessories. 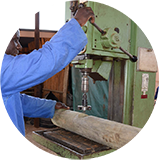 We do offer certain services like cutting, drilling and planing of poles and planks. 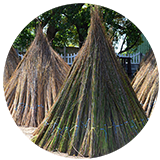 Northern Poles and Thatching is a pole yard and supplier of H4 Treated Poles and Thatching material in the north of Pretoria. 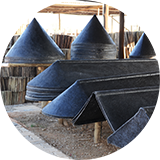 We supply Treated Timber and Wooden Poles, as well as Thatching Grass and Cape Reed, Fibreglass Ridging and all hardware necessary for building a thatched roof or lapas. All our poles are CCA treated and SABS approved. CCA is an acronym for “Copper, Chrome and Arsenic”. The Copper and Chrome compounds in the mixture is the preservative Arsenic guarantees that no timber-eating insects damages the poles you purchased. All our poles are treated with CCA to level H4. 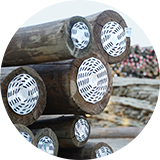 In accordance with SAWPA (South African Wood Preservers Association), H4 treated poles are suitable for ground contact and periodic wetting. These poles are ideal for agricultural posts, landscaping, structures, decking and bridges. All our poles are issued with an anti-split plate (gangnail) at each end stating the SABS mark. The CCA treatment penetrates a minimum of 13mm into each pole in accordance with SABS regulations and poles are inspected on a regular basis by SABS officials to ensure that you get the quality you pay for. As with most commercially grown timber, South African plantation grown pine and eucalyptus are not durable and are therefore subject to attack from fungus and termite. This is why it is necessary to ‘treat’ timber with wood preserving chemicals if you require confidence in its performance. Taking this a step further, SAWPA together with the SABS and representatives from the timber industry established the Hazard Classifications. In South Africa we have 6 hazard class levels of treatment for wooden poles and timber. CCA and Creosote are mostly used for this and higher H class treatments. H3 covers balustrades, wood fencing bearers and slats, outdoor decking and beams, garden furniture, laminated beams, weather board, steps, cladding, stairs, log homes, gates, fascia boards and plywood. Spacers and cross arms used with electrical, distribution, telephone and light poles are treated to H3. This level of treatment helps prevent agricultural posts and landscaping structures from rotting and termite attack. Also recommended for treatment in this hazard class are playground structures, wooden fencing, pergolas, carports, flower boxes, decking, bridges and stakes, as well as electrical, distribution, telephone and lighting poles. Timber poles which fall into this category, is timber exposed to continual wetting or where the timber is planted in wet soil. Timber which will fall into this category could be jetties, drains, walkways, retaining walls and slipways. Only the use of the CCA chemical with Creosote is recommended for this application. Only timber poles treated with both these chemicals will offer complete protection against marine borers. Jetties, slipways, retaining walls and walkways will fall under this section. In South Africa all treatment plants producing treated timber are monitored through a compulsory third party product certification scheme. All treated timber is required to show not only the product certification mark of one of the approved certification bodies, but also to which H class the timber poles have been treated. All prices on this web site are subject to change without notice. Whilst we make every effort to provide you the most accurate, up-to-date pricing and information, occasionally, there may be pricing errors. Customers are urged to contact our office to obtain an official quote.